Hi Everyone! Wendy here to share up a Simply Creative post for you today using Simple Stories 4x6 transparencies! 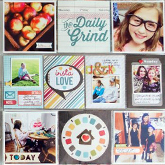 I remember when the first Simple Stories kit (Life Documented) was released, my fav part of the kit was the transparencies because I love transparencies in any size...mini, photo size, 12x12...and these are just a great addition to the kits to add a bit of flair to your scrapbook pages AND altered projects!! With Simple Stories, we encourage you to think "outside-the-box" when incorporating Simple Stories pre-designed signature elements in your layouts and projects. We want to show that the elements can be used as stand-alone elements. This can be done by using elements even in altered projects. Just be creative!! I have one more project to share with you from my CHA Summer projects and this one is an altered project, titled "Slice of Summer". In this project I used the 4x6 transprancies from the 100 Days of Summer Collection to create "windows" on this wood case wall hanging. I picked up this unfinished wood case on my trip in Italy back in May with intentions to alter it. Well, after a bit of thought...voila! The windows in the wood case were just the perfect size for the 4x6 transparencies. I painted the unfinished wood case with white acrylic paint. Further, I distressed it a bit using a sanding tool and brown ink pad + sponge. I used banner stickers from the 12x12 Fundamentals Cardstock Stickers #1402 and attached to the 4x6 Transparency Photo Overlay with mini staples. I attached the transparency to the wood case using Glossy Accents. I used my typewriter for a bit of journaling on the cloud diecut. Further, I used Stamps - Unity Stamps Co-Brand Simple Stories (sun, cloud) for the background on the background. The bottles were filled with sand from the local beach. Wood Box Case - Stamperia (purchased in Italy), Acrylic Paint-Liquitex (Titanium White), Clear Bottles - 7 Gypsies, Lemonade Set, Cola Cans - Mayberry St Miniatures (dollhouse furniture), Punches - Fiskars, Sponge Blending Tool - Ranger, Ink - Ranger - Distress Ink (Walnut Stain), Ink - Ranger - Archival Ink - Jet Black, Eyelets - Making Memories, Glimmer Mist - Tattered Angels (Patina), Tiny Attacher - Tim Holtz, Glossy Accents - Ranger, Vintage Typewriter, Pop Dots - American Crafts, Sand (local beach). I am in LOVE with the new BABY STEPS Collection! Be sure to read all the way down this post for your chance to win some! After using the 6 x 6 Paper pad for the base pages, I used the 4 x 6 elements for additional inside pages. The 1st - 12th month journaling spots are perfect elements to place across from the monthly photo space. I love that they are 2-sided and the back adds extra space for more journaling and/or photos. Every month has a page for a photo, a card for monthly milestones, and two additional mini elements for added photos and/or journaling. I can't wait to give this to my daughter-in-law at her baby shower. All she has to do is add photos and journaling and she will have a baby book for the Baby's First Year! I made it super easy and labeled what size photos to add to the journaling blocks. In addition, I will add a good journaling pen and some adhesive for her too! Here is a bonus for you today! A couple extra designs that were created for the booth at CHA! Did you make it all the way down here? If you did, guess what? If you head over to my blog today, I have a Baby Steps 6 x 6 Paper Pad giveaway for you to enter! All y ou have to do is leave 2 comments - one here and one on my blog post. I will draw a winner on Monday night, the 22nd! Good Luck! Thanks for hanging out with me today! Enjoy your weekend! Hello lovely lovely Simple Stories fans!! Wendy here with a Simple Basics post this Monday. This time I'm sharing up with you a card I made using the new Baby Steps collection released from CHA Summer 2011. I have no children but this collection is perfect for creating up beautiful cards for baby showers, gifts, and if you're like me, I maximize the potential for my scrapbooking product by looking at all the embellishments included in these awesome collections and ways to create outside of the "theme". As you can see in this card, I went "out-of-the-theme" with a non-baby theme. So, in looking at all the beautiful images on papers, sticker sheets, etc. I was drawn to the hot air balloon. This was my thought process that inspired me in creating up this card. Further, I knew I had some "begging to be stamped" hot air balloons stamps in my HUGE stamp stash and used these on the card too. Pssssst....there's a hot air balloon stamp in the coordinating co-brand Simple Stories Unity Stamps you can find here. 1) Here I trimmed out the hot air balloon (and so carefully trimming out the balloon basket) from the Baby Steps 2x12 Border & 4x12 Title Strip Elements #1614 paper. Lay to the side. 2) Used a Prima hot air balloon masking template along with some Smooch Spritz by Clearsnap for the misted hot air balloons you see in the background of the stamp. Allow to dry/speed up drying with heat tool. WIth the mask still in place, I used Simple Stories co-brand Unity Stamps "clouds" for the sky. 3) Using Simple Stories co-brand Unity Stamps greeting "Celebrate Life", I stamped this sentiment in the above right corner. 4) Using some additional hot air balloon stamps, I added a level of interest & distance of many balloons in the sky on the card to make the large balloon "pop out" for 3D dimension on the card. However, next, I measured simply where I wanted the large balloon to go on the card. I laid the balloon on the card (not yet attaching) as a guide where to lightly pencil/pen in the "strings" of the balloon. Remove the balloon. Then, I used my sewing machine to stitch the lines for the "strings". 5) Next, I mounted the large hot air balloon on pop dots (including the cute little basket). 6) I used the Distrezz-It-All Machine to "roughen up" the edges. LOVE LOVE this machine!!! Also, as a nice touch, I stamp the flap of the greeting card envelope in a coordinating stamp that matches the card. Cardstock - American Crafts (Kraft), Hot Air Balloon Mask/Stencil - Prima, Ink - Ranger - Archival Ink - Jet Black, Smooch Spritz - Clearsnap (Log Cabin), Sewing Thread - Gutermann, Pop Dots - American Crafts, Stamps - Kaisercraft, Distrezz-It-All Machine - Zutter. Hi All! Wendy here to share up some "Simple Inspiration" for ya' this Saturday! I've been on the road traveling a bit in my full time job and I usually scout out scrapbook stores on my travels. I hit the Archiver's in Memphis, TN and had chills to see the papers there! So HAPPY for Simple Stories and all the great support & love for the collections. Still a few CHA Summer '11 projects I have in my stash to roll out in sharing & here's another using the "100 Days of Summer" collection. I "simply" can't get enough of this one so this tells ya' it's one of my FAVS! Anyhoo, here's my capture for my sweet tooth craving...Enjoy! Also, added some paper scraps from this collection to some clear acrylic fragments for a neat dimensional effect. Love the Simple Stories + Unity Stamps co-brand stamps! Here I used the sentiment "sweet summer memories". All the accents -- letter stickers, tabs, labels, etc. -- in this collection really scream SUMMER colors & just make me happy! Cardstock - Bazzill, Smooch Spritz - Clearsnap - Sunkissed, Vanilla Shimmer, Chipboard Letters - Cosmo Cricket, Rubons - Cosmo Cricket, Heart Trinket Pins - Maya Road, Brads - Recollections, Staples - Tim Holtz - Tiny Attacher, Ink - Ranger - Archival Ink - Jet Black, Dewdrops - The Robin's Nest, Clear Acrylic Fragments - Ranger, Circle Punch - Fiskars, Bling & Pearls - courtesy of Want2Scrap (Red, Smokey Brown), Stamps - Jenni Bowlin, Typewriter - Vintage (used for journaling), Thread - DMC, Machine stitching. Hello there! Today, I want to share a layout I created for CHA Summer '11 using the Happy Day line. You saw a sneak of it on the blog earlier this week, but I've got some detailed ideas for you to use today. I wanted some dimension on the page, so I hand cut three balloons from the Happy Day Flash Cards (#1509) paper, the balloon side, and arranged them over my photo then popped the up with adhesive foam. You can do this with many of the different elements in this line, it's one of my go-to ways to get dimension! I also tied each balloon with some twine, another easy way to add texture to your design. A few more tricks for you, including misting with star masks. I wanted a very subtle way to highlight the actual birthday on the It's Your Day paper (#1507)––one of my favorite papers in the line! So I punched a few stars and strategically set them on the calendars, then sprayed lightly with Studio Calico's Clay Mister Huey. The paper is already distressed slightly so the misted area doesn't detract, but does allow for a subtle image to appear. I put one of the stars over the exact birthday (haven't filled it in for privacy's sake just yet...) and now I'll be able to remember the exact date on the calendar! My title was cut from a journaling card off the 4x6 Journaling Card Elements #2 (#1511) paper, and popped up with dimensional adhesive, such a fast and easy way to add your title! Finally, I stamped the journaling block (one of our stamps done in conjunction with Unity Stamps) with Versamark and embossed it. This adds such a rich texture to the page and the embossed color is so intense, a perfect match for the yellow in the line. I love the look of embossing! I hope I've been able to give you some ideas on using the Happy Day line that you can use on your next project. I am big on hand cutting embellishments from what you have, it's one way to guarentee a perfect match! Did you hear the news??? Just in case you missed it, I thought we would share it with everyone on our blog! We met Suzy at the Summer CHA show and we were absolutly thrilled when she asked us about teaching classes for us! Suzy has been working on a few classes already and sent us over this cute sneak peek of a darling class she is creating using our new 25 Days of Christmas collection. We can't wait to see what she comes up with next! We will keep you updated as she sends us new classes and ideas, but feel free to email Suzy at; psajfamily@aol.com for more information about teaching a class at your next event or store! Did you hear? Simple Stories received some honors by the reporters over at Craft Critique for their showing at CHA. Since our Simple Style posts are all about what's trending, it seems only fitting that we showcase one of our hottest new lines for today's post. As someone who is always stuck when it comes to birthday cards, I was so excited when I saw the Happy Day collection arrive on my doorstep. I'm also one who loves to mix and match products and lines. So, I was pretty excited as I rummaged through my Unity/Simple Stories stamps and found the fun bingo card stamp. Time to stock up on some birthday cards. For my first card, I stamped my image and then went to town with my markers. I finished off the stamped image by rubbing some grayish ink around the edges. Next, I cut up a piece of the calendar paper for the bottom half of the card and then cut out the banner from another sheet and wrapped it around a toothpick to make the flag. Instant sentiment. This second card was so quick and easy it should be a sin. The card base is taken from a pre-printed background and simply folded in half. Then I quickly took a few stickers from the alpha sheet, put them on the circles and voila' - instant birthday card. Now I just need to find someone who's having a birthday! You know the saying..."better late than never", well that is my motto for today's post! I have been meaning to get our Simple Stories CHA recap posted on our blog ...but with this being our second show we're finding the first few weeks following CHA are just as busy. So I apologize for my delay in getting our photos and recap up! Just know we're busy, busy working behind the scenes shipping out our first two collections, Happy Day and Baby Steps, and already planning/designing/developing our next few releases!! Can I just say how excited I am about the future plans we have for our Simple Stories product line - 2012 will prove to be an awesome, innovative year for Simple Stories and you'll see a variety of exciting additions to our Simple Stories brand! Eeeeeeeeek...I so can't wait to share them with you!! In the meantime I want to thank all of you for your passion, enthusiasm and excitement about our Simple Stories products. Thank you for embracing our system and products - we LOVE to create products that help inspire, motivate and liberate you to tell your story - whether you use our products with your traditional scrapbook pages, albums or pages or love our quick and easy system to share your story simply! Simply Creative - Shadow Box! The different sized elements in each of the Simple Stories Collections are my favorite parts of each line. I love all the different options they give my when I'm creating. I can work with 3 x 4 cards, 4 x 6 cards, 4 x 4 elements, 6 x 12 elements and more. Those predesigned elements make easy work of all kinds of projects whether they are mini-books, layouts, cards or altered home decor! So imagine how excited I was when I found out that Simple Stories was going to have 6 x 6 paper pads to go with each collection! Now we have even more options because all of the original page elements now come in minature sizes too! Now those original 3 x 4 cards come in cute little 1.5 x 2 cards too! Everything you get in the large paper sizes just in minature! The new 6 x 6 pad that coordinates with the new GENERATIONS line is what I used to create my mini shadow box! I was able to find the perfect elements to fit inside each of the little cubbies in my minature shadow box. I added some ink, some layering, some chipboard and some pop-dots to create my design. It was quick and easy thanks to that fabulous little 6 x 6 paper pad! Of course, those minature pads are also perfect for card making too! Thought it would be fun to share a sketch and project with the fabulous Destinations collection in honor of all of the traveling that many families do in the summer. My family has certainly spent some time visiting different parts of our country and the state that we live in. Plus, I just adore the Destinations collection for its rich colors and textures which seem to work beautifully with many of our vacation photos. I thought it would be fun to create a two photo layout for one side of my album and then use the Simple Stories system to create the second page using the Destinations Elements and a few more 4 x 6 photos to finish off the adventure. It is also fun to layer the 4 x 6 Journal cards into the page to create more sentiments like I did with the On the Road Again Journal Card. I used the 6 x 12 Element and added an addition 4 x 6 photo and title. Then I just put three vertical 4 x 6 photos side by side in the pocket protectors. The two pages work together beautifully. Love the awesome sticker sheets that come with the collection, because it offers many embellishment opportunities like the compass below. I only added a few pop dots to really make it jump off the page. The colors and textures in the paper and stickers are extraordinary! I also love the alphabet stickers and sentiments. Each little detail adds more fun to the page. Goes into my album as Simple as That!